There is a good chance that most childhood scars will fade but depending on the location of the scar, they may shrink or get bigger as the child grows. 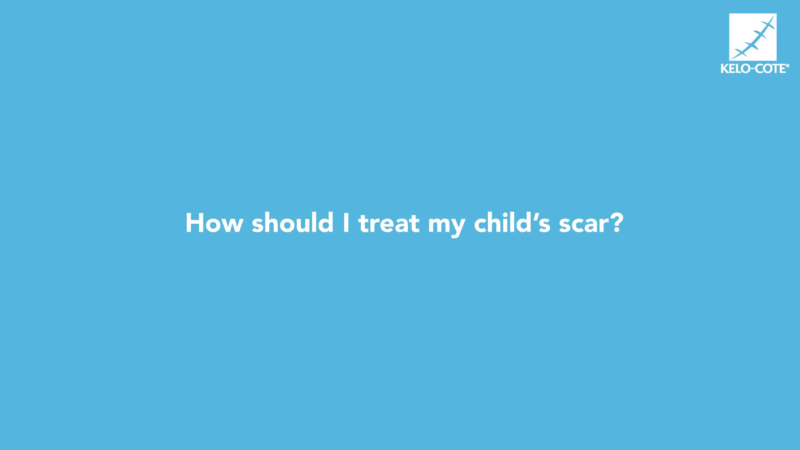 To minimise the impact of scarring it is important to make sure that you follow a number of steps to give your child’s wound the best chance to heal. HOW CAN I MAKE SURE MY CHILD’S WOUND HEALS PROPERLY? Depending on where the wound is on your child’s body, you can leave the original dressing in place for around five to seven days. Seek advice from a healthcare professional about when to remove it. Covering up a wound with a moist wound healing product provides an optimal wound climate which will enable most favourable conditions for wound closure (epithelisation), the formation of new tissue and the immune system. It will also let the healing process remain undisturbed to ensure faster healing and prevent scab formation to optimize cell migration and reduce the likelihood of scarring. UV exposure has been shown to influence the wound healing process by causing immediate UV-induced inflammation, followed by increased skin pigmentation, which may result in long term pigmentation of a fresh or recent scar. It is therefore very important that scars are protected from the sun5. The NHS recommends that complete sunblock is used for at least two years. 4 NICE (March 2016) Chronic wounds: advanced wound dressings and antimicrobial dressings. Evidence summary ESMPB2. Do You Have A Question About Kelo-cote®?